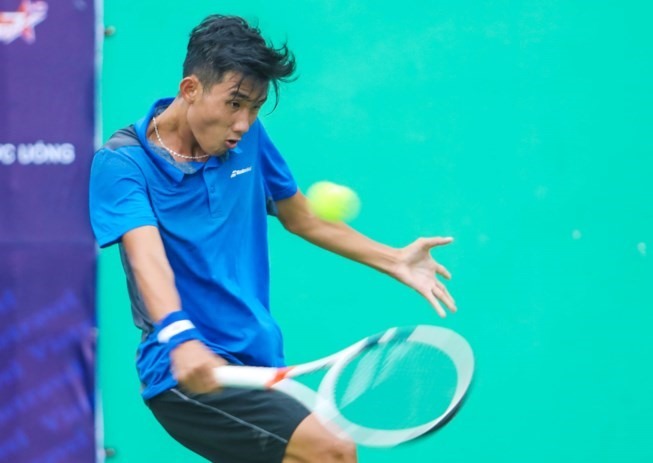 HÀ NỘI – Young Vietnamese ace Nguyễn Văn Phương defeated Hsu Yu Hsiou of Chinese Taipei in the first round of the men’s singles of the Mens’ Futures F1 tennis tournament in the southern province of Bình Dương yesterday. The 16-year-old Phương, who ranks in top 300 of the world junior rankings, crushed world junior No 13 Hsiou 6-4, 6-3. Another Vietnamese representative, Phạm Minh Tuấn, beat Kesley Stevenson of Canada 6-3, 6-0. Both national bronze medallist Phương and Tuấn earned wild cards to compete in this tournament. In the men’s doubles, Vietnamese Lý Hoàng Nam and Ti Chen of Chinese Taipei came from behind to best Lin Wei-de of Chinese Taipei and Wan Chu Han of China 4-6, 6-3, 10-5. The duo Nam and Chen triumphed in the men’s doubles category of the Mens’ Futures F9 in Bình Dương last year. The tournament attracted the participation of 30 players from 22 countries and territories including Japan, Canada and China, competing in the men’s singles and doubles.